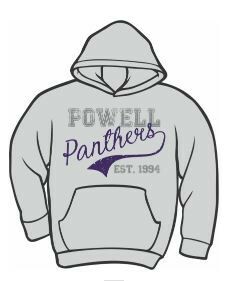 Powell Spirit Apparel Orders Due on the website link below. This store is open for business and will close on December 4 at midnight. No late orders. No exceptions. No phone orders. 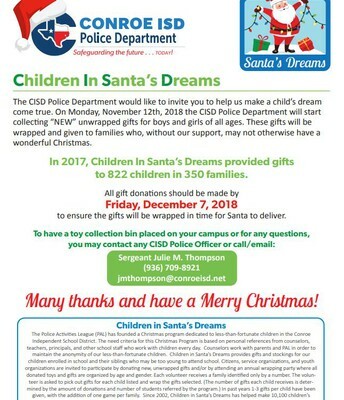 We will deliver before Dec 19th. 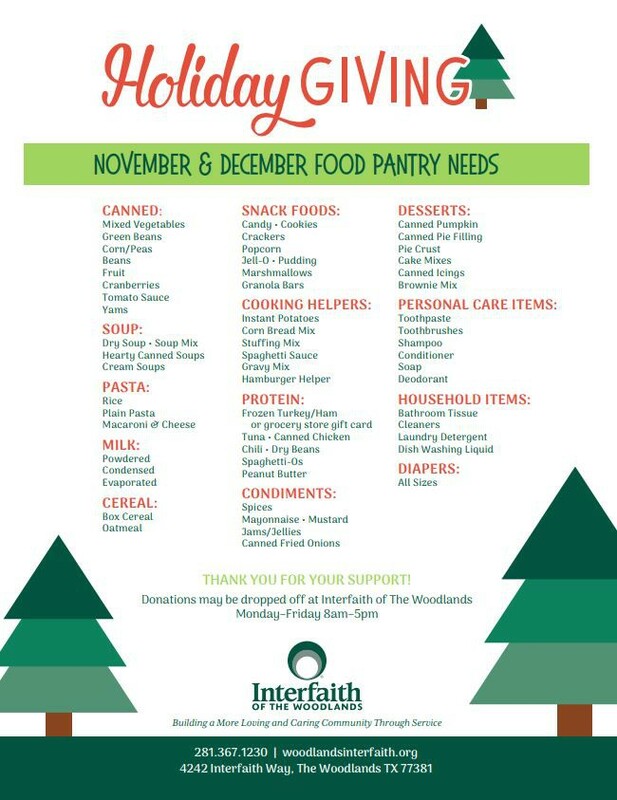 This Friday morning, December 7 at 8:20, we will host our Annual Interfaith Food Drive.This is one of our favorite Powell traditions started in 1996 to give back to our community! The festivities for that morning include our Treble-Makers Choir singing. We encourage each of you to participate in this wonderful cause. Parents are invited to join in the festivities that morning! 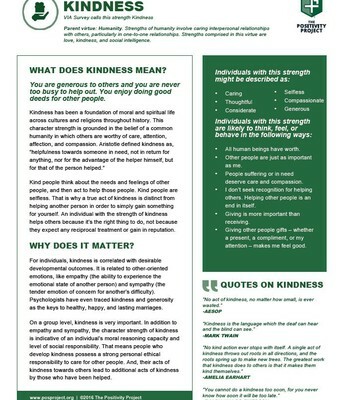 The Interfaith Wish List is included below. 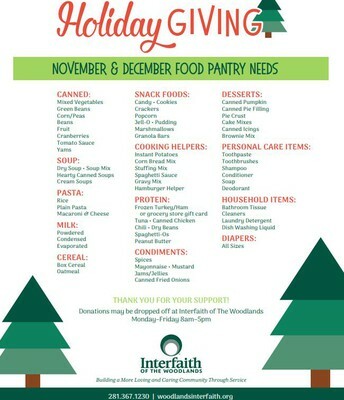 We are doing a school wide food drive on Friday, December 7 benefiting the Interfaith Food Pantry. Donations will be collected in the classroom beginning Friday, November 30. 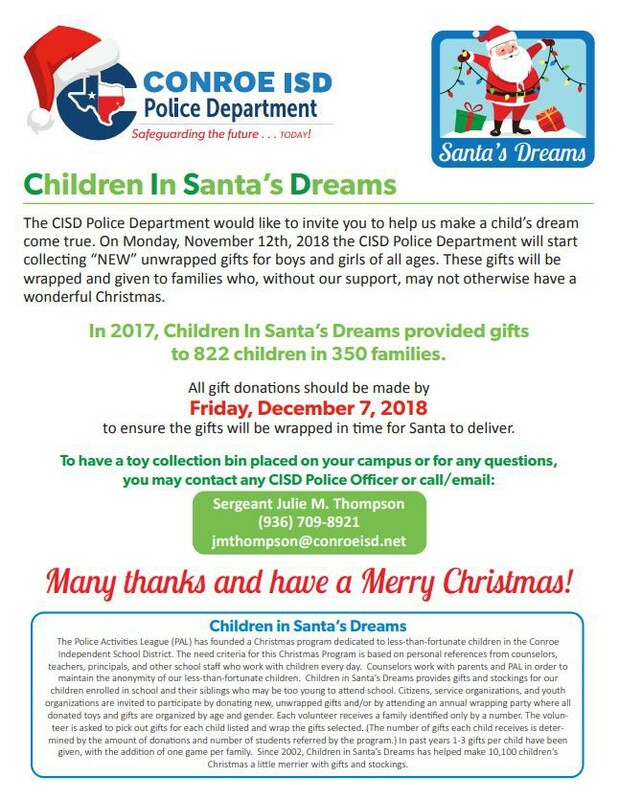 All donations must be in by 8:20 a.m. Friday, December 7. 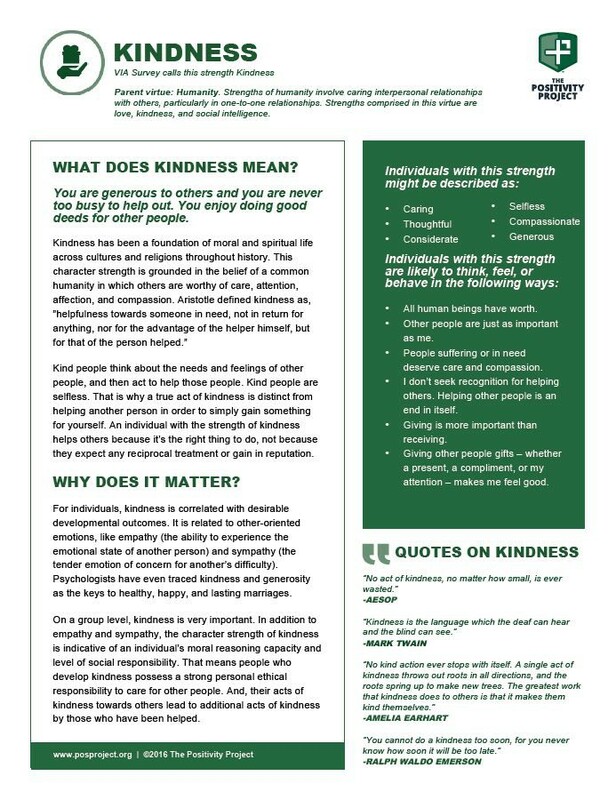 Positivity Project Character Trait of the Week is Kindness. PTO is looking for a Spirit Store Co-Chair. Spirit store co-chair helps with the purchasing and running of the monthly spirit store. 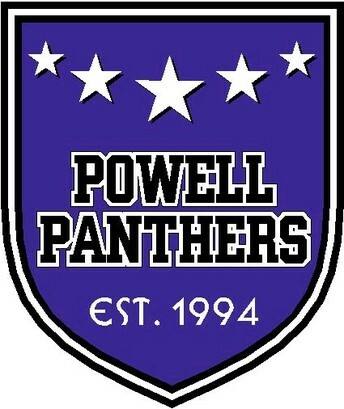 If you would like more information please email Becky Harel at president@powellpto.org. Three times a year we seek volunteers to cover Lunch & Recess Duty for our teachers. During this time, the teachers are able to eat together as a team. All grades need more volunteers to make this successful! The second request for Lunch/Recess Duty is Friday, December 7th. Girls on the Run (GOTR) Coaches Needed! What is GOTR? GOTR is an afterschool program for 3rd and 4th grade girls that promotes: leadership, citizenship, health and fitness. Trained coaches lead the girls through research-based curricula, which includes dynamic discussions, activities and running games. The program runs for 10 weeks starting in February. It culminates with the girls positively affecting their communities through a service project and being physically and emotionally prepared to complete a celebratory 5K event. GOTR is in need of a few coaches to help with the spring season. So warm-up your spirit fingers, lace up your sneakers and help inspire a group of girls to be strong and healthy. If you are interested in coaching, you will need to go to a training session and become CPR/First Aid certified. Please email Pam Owens as soon as possible at powens@conroeisd.net if you are interested. Please be aware that we have limited seating for parents at all lunch times and may not have enough seats for all parents who may be interested in eating lunch with their child. We sincerely apologize for any inconvenience this may cause. 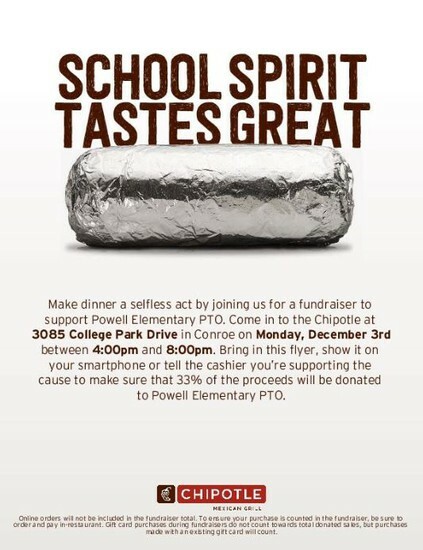 Join us for a Spirit Night to benefit Powell! TWHS Boys Varsity Basketball team is excited to be hosting our annual boys varsity basketball elementary night for our TWHS elementary feeder schools. The game is scheduled for Tuesday December 11th against Klein Cain High School. 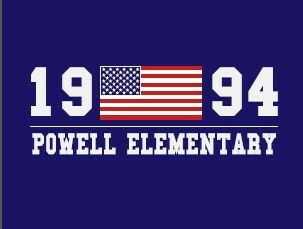 The game will start at 7:00 p.m. Our elementary schools will be recognized that evening at the game. We recommend encouraging attendees to arrive a few minutes early to get in and find seats. 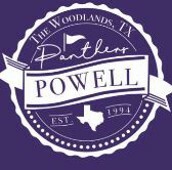 As a reminder students from TWHS feeder schools who wear their school shirt to the game will be permitted entrance to the game free of charge. Everyone else, parents, siblings, spectators, etc. will be subject to the normal ticket rates/policy. As always, a CISD employee badge will allow the employee and immediate family into the games free of charge.